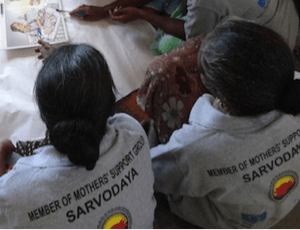 Sarvodaya Women’s Movement (SWM) was started in 1987 as an offshoot of the Sarvodaya Movement, and registered as an independent organization in 2001. Our organization has been set up to address all issues relating to women. We have at the moment 6 full time staff members to carry out programme activities and administration at the SWM head office. 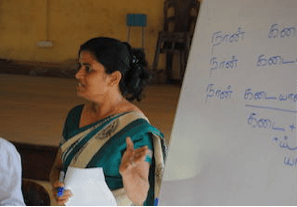 SWM has taken the lead in livelihood programmes, empowerment and gender issues in Sri Lanka. The Vision of SWM is to provide women with opportunity and direction to assume their rightful place in society and realize their aspirations, hopes and strengths. We hope to empower women by generating awareness of women’s rights and women’s issues, and to build the capabilities of women through assisting them to acquire knowledge and skills in a holistic manner that will enable greater self-reliance and responsibility. Capacity building for economic empowerment and agriculture. Women as activists for peace & co-existence. Improving the health standards of women, including reproductive health of young women. Relief and rehabilitation of disaster-affected women. Poverty alleviation through international collaboration. Partnered with the Global Fund to carry out a HIV and Malaria immunisation programme in Sri Lanka with the support of the government of Sri Lanka. Becoming a partner organization in Sri Lanka for Migrant Forum Asia, participating in their workshops and seminars on regional migration issues. MADE Projects being implemented in Anuradhapura, Vavuniya and Kurunegala districts. Celebrated International Women’s Day 2016 with events in the districts of Polonnaruwa, Batticaloa, Nuwara Eliya and Jaffna. Conducted awareness campaigns to coincide with the International 16 days of GBV activism to eliminate Gender based violence. These were conducted in Vavuniya, Galle, Badulla and Kebethigollawa. Floods Relief for those who were effected from the 2016 floods and landslides in the districts of Puttlam, Gampaha, Kegalle and Colombo. Elderly Care Givers Awareness Programme on nutrition promotion for Maternal, Infant, Child and Youth Groups, in the districts of Kurunegala, Kegalla, Gampaha and Colombo. Safe Migration Promotion programme in the districts of Vavuniya, Anuradhapura and Kurunegala. In the process of setting up a “Kulagana Diriya” Centre for counseling and free legal aid in-house.